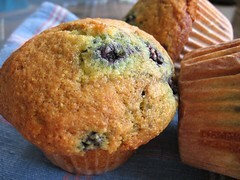 Lemon Blueberry Muffins - Do You Know The Muffin Man? Notes: I always cut down on the butter in this recipe, from 8 ounces to about 6.5. The colour is a bright yellow and comes from the cornmeal, eggs and lemon zest. Frozen wild blueberries work fine in this recipe. One of my favourites.